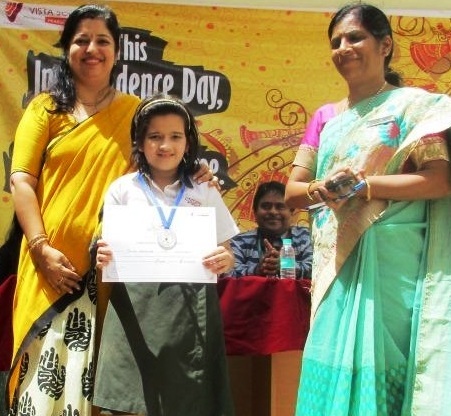 Hyderabad, August 2016: Vista School managed in association with Pearson, world’s leading learning company celebrated their inter-school Independence Day cultural fest – ‘TIRANGAA 2016’ at Hyderabad. The fest was attended with great enthusiasm by over 465students from 21schools, they celebrated keeping in mind the theme for this year, India's Visual and Performing Arts which aims to celebrate India’s rich culture and heritage. The month-long celebration will also take place in other Pearson managed schools, Hillside Academy and Pearson School, Kompally. India is a melting pot of cultures and every state is known for its unique form of visual and performing arts. The theme India's Visual and Performing Arts was chosen to celebrate our rich cultural heritage. It was a platform for students to witness various dance forms, music, painting and dressing styles and take pride in our cultural diversity. The fest included activities like fancy dress (folk dance costumes of different states), sculpting, Indian folk dance, rangoli competition, madhubani painting, photography and folk music to name a few. Students enthusiastically participated in the competitions and everyone came together to celebrate the spirit of Independence. ”It was great to watch the school decorated in tri-colors and everyone pitching in to make it a huge success. When we all take some time out of routine and indulge in celebrations it refreshes our mind and helps us get to know each other better. I look forward to more such cultural events in the coming years”, said Mr. Harish Doraiswamy, Vice President, Pearson Schools. The activities were assigned to students based on their classes. Students from pre-primary 1 and pre-primary 2 had coloring and fancy dress. Grade 1 and 2 were given the options of sculpting using play dough and storytelling with props. For grade 3 to 5 it was pot painting (Madhubani painting, Warli painting, Kali ghat painting, Gond painting) and Indian folk dance. Students of grade 6 to 8 had classical dance (solo) and dream merchant, Ayurvedic product. Grade 9 to 12 had the options of photography and MIME and for the school event, there was folk singing and rangoli. “Since the last three years, Pearson Schools have been organizing Tirangaa with great success. While it is a great platformfor the whole school to come together and celebrate, it also teaches students to appreciate our culture and understand the concept of ‘unity in diversity’ the entire school wore a festive look and it was truly a treat to the eyes to watch young children soak in the spirit of patriotism,” said Ms. Jaya Mani, Principal, Vista School. Tirangaa was conceptualized by Pearson Schools in line with the vision of tapping hidden talent in every child. The event which is organized every year on the occasion of Independence Day provides a fun inter-school platform for children to compete and exhibit their skills within their respective age groups. Pearson Schools is a part of Pearson, the world's leading learning company. With over 29,000 students across 13cities in the country, Pearson Schools offers school management services in India, with a vision to create future-ready global youth who will enhance society through their scholastic achievements, exceptionally honed life skills and holistic overall development.